On the wheel, students will be exposed to the fundamentals of wedging, centering, lifting, trimming and glazing. 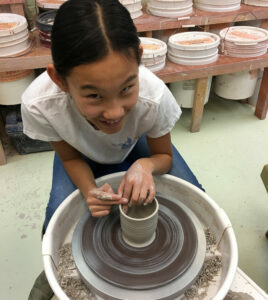 With Hand building/Sculpture, students will learn how to make functional pottery with slab, coil and pinching techniques. Each class will be a small setting of 7-12 students and each student will receive individualized instructions according to his or her interests, experience and skill level by our accomplished artist/teachers. Various decorating techniques will be taught and will determine the amount of time as to when your pottery will be finished after firing. Most pottery will be ready for pick up 3 weeks after our session has ended. We will provide a snack and drink.